Paytm will give a rating to users on its platform based on their digital transactions online. The Digital India push may receive a fillip through the efforts by Paytm to launch its own credit score Paytm Score, very much on the lines of the CIBIL credit rating that has been the only parameter on which the Indian banking system has been approving loan applications. The record of digital transactions users have carried out within the digital payments major’s ecosystem will be the basis on which it will make the evaluation of creditworthiness of an individual. Paytm has its e-wallet, Paytm Mall and also the booking platform across which customers use their digital payment modes to make payments. These transactions will form the basic data which will be fed into the appraisal system and the ratings given. These ratings can then be shared by Paytm with lending agencies with whom it has already entered into partnerships and it has already added to its stable, a lending vertical Creditmate, which it acquired organically a few months ago. Apart from this, Paytm has an agreement with ICICI Bank for offering short-term credits on an interest-free basis and these loans are sanctioned without any delay. The credit rating program may itself become a financial product for Paytm and it is learnt that it has offered this to some online lending agencies and NBFCs interested in moving away from CIBIL. The demonetization move by the Indian government, in late 2016, has helped Paytm expand its business and that has, in turn, brought in high profile investors, such as SoftBank. With that backing, the company is now able to focus its attention on growing all the verticals under its management. With Paytm Mall and Paytm Payments Bank already doing well Paytm has expanded into new segments such as insurance, online grocery delivery with BigBasket, online ticket booking, initiatives to set up a money market fund, the partnership with PVR and more. The firm might want to evolve into a large conglomerate of services. The government is looking to provide higher tax incentives on home loans to boost demand and prop up the faltering realty sector that has been further hit by demonetisation. Sources indicated some concessions may be offered in the Union Budget to increase the tax benefit on payment of interest beyond the annual Rs 2 lakh, a measure that is expected to provide a fillip to the employment-intensive segment and please taxpayers. The move to enhance the tax concessions comes soon after the Centre prodded banks to pare interest rates, including on home loans, in the wake of massive inflow of deposits. The government is, however, yet to make up its mind on reworking tax slabs. Sources said the extent of increase on home loans had not been worked out. In the past, too, the government has been favourable towards demands from the construction sector given it is employment generating and helps boost demand for cement, steel and other construction material. While there is an expectation that the Modi government could reach out to the middle class through tax concessions, there is a view in the government that expected gains from demonetisation will flow only from the next financial year and the Centre may have to loosen its purse strings to boost public spending. Companies which were already holding back on capacity addition due to high debt and low demand, are unlikely to rush in with fresh investment over the next few quarters given that consumers are holding back purchases post demonetisation. 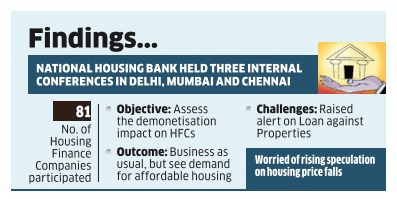 The real estate sector, affected by a spate of delays and low demand in the wake of high interest rates, has been particularly hit by demonetisation. A recent study by consulting firm Knight Frank estimates a 44% fall in demand, resulting in revenue loss of Rs 22,600 crore since November 8 when Rs 500 and Rs 1,000 notes were scrapped. New Delhi/Mumbai: The Reserve Bank of India (RBI) on Saturday unexpectedly ordered banks to deposit their extra cash with it, in a bid to absorb excess liquidity generated by a government ban on larger banknotes. Many Indians deposited their old notes with their banks after the ban on Rs500 and Rs1,000 notes on 8 November, which is aimed at tax evaders and counterfeiting. Banks had put some of this cash into government bonds, sparking a rally that saw the benchmark 10-year bond yield fall more than 50 basis points to its lowest in more than 7-1/2 years. The central bank said banks would need to transfer 100% of their cash under the RBI’s cash reserve ratio from deposits generated between 16 September and 11 November, saying it was a temporary measure that would be reviewed on or before 9 December. Traders called it a drastic move intended to dent the rally in bond markets, adding that the RBI could have opted for more modest measures such as sucking out some of the liquidity through sales of market stabilisation bonds or telling banks to park funds under reverse repos. The action could also temper market expectations that the central bank would cut interest rates by 25 basis points at its next policy review scheduled for 7 December, after already easing them by the same amount at its last review in October. “The move is more of a ham-handed one than the finesse expected from the RBI,” said Shaktie Shukla, founder of boutique investment advisory firm Kaithora Capital. The move is likely to drain over Rs3.24 trillion from the banks, according to Reuters estimates. Traders said bond market yields could rise 8-10 bps on Monday, given that the RBI move would deprive the key source of funding seen in the past two weeks, while banking shares would likely take a hit. Bond investors had also bet India’s demonetisation action would dent economic growth as consumers held back on purchases, raising the prospect of a rate cut by the RBI. At the same time the bond rally had increased hopes it would lower borrowing costs in the economy and allow banks to reduce some of their lending rates.